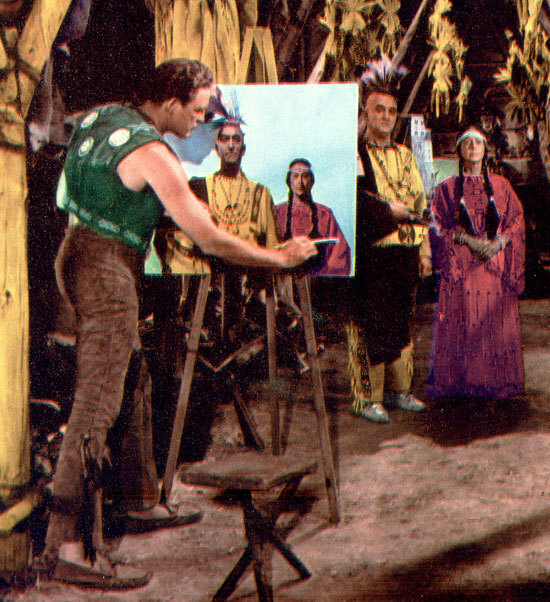 Lobby card photo �1956 20th Century-Fox Film Corp.
Frontier illustrator hunk Jonathan Adams (Scott Brady), takes on an assignment by a Massachusetts society to paint "frontier scenes" in the 1956 20th Century-Fox film "Mohawk." He seems to have no problem painting a portrait of Mohawk Chief Kowanen (Ted de Corsia) and the missus that coincidentally looks exactly like a photograph -- in spite of no art supplies at all, except for a rather crude frontier taboret and his trusty No. 12 frontier chisel brush. He has a hot time with his new-found artist's model, Greta Jones (Allison Hayes) while fooling around with the Chief's daughter, Onida (Rita Gam), until fiancee Cynthia Stanhope (Lori Nelson) arrives from the east and ruins all his fun. Man, you can't turn your back on an illustrator for a minute! Those ain't real Indians anyways. Art on top of Art on top of Art. The 'painter' looks like he should be on the Jack and the Beanstalk set.